The aim of Paediatric Foundation of Kimbondo is "to accept, free of charge, children who are sick, orphans and abandoned, and who have no support from the families of origin. The Paediatrics, therefore, wishes to help through medical care and to provide socio-cultural assistance: its purpose is the development of the human being. Currently, paediatrics hosts about 500 children of whom about 200 are educated but the cost of school fees is very high. The Pediatrics trains, starting from primary school, all children by giving them basic education and the opportunity to have, since primary school, a proper education so that children with a traumatic past (abandoned, orphaned, sick) are taken care of 360°. Moreover, children who are not housed at the Paediatrics (those who live nearby) could enrol paying tuition fees. In addition, the education system in the Democratic Republic of Congo does not provide opportunities to young people at the end of secondary school because school programmes are not adequate to the needs of today's society. Indeed, the national education program does not provide the "schools of trades" (carpenter, hairdresser, electrician, plumber, computer expert etc.). Most of those who carry out these do not have proper technical training. Unfortunately, the period of learning it is neither well organized nor valued. The content and quality of depends on the trainer and his good faith. Despite this type of learning method, Congolese society does not recognize the value of this system as no specific certificate is issued at the end of the period of training. c) The assessment, by an external body of technical knowledge attained by the young person. 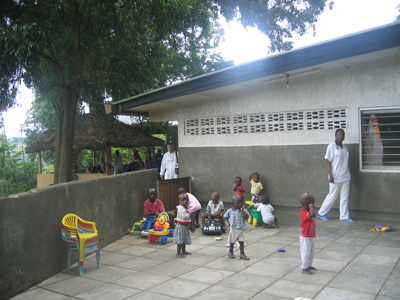 Kimbondo Paediatrics seeks firstly the construction of an adequate primary school and a school of vocational training with the aim of contributing, through a solid education, to the reintegration of young people in Congolese society and restore their dignity as human beings in a country where the minimum is not insured by the majority of the population. - A building, with a single floor, for the primary school with 7 classes, a small deposit, a room for the headmaster. - A building, with a single floor, for the vocational school with 4 workshops, n.2 classes for special courses, an office, a faculty room and a deposit for the teaching material. Each classroom / workshop will have a window for ventilation. The two buildings will be connected by a covered walkway. Around the facility there will be a green area with toilets and septic tank. General Goal: give young abandoned / orphans of Kimbondo Pediatrics the opportunity to learn a trade to enhance their social reintegration. 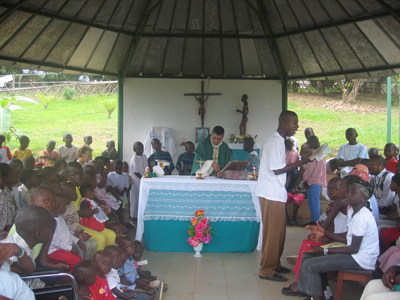 Specific Goal: construction of a primary school and vocational training centre.